DeveloperStation.ORG: your own rss feeds !!!! the following is a small tutorial to build your own rss feeds. RSS stands for (Really Simple Syndication (RSS 2.0)). it is an simple summary of the site updates in text format. he drop down list is the list of updates, the site wants us to check out. lets come down to the basic syntax of a rss file. basically the rss feed exists in a XML file (generally in a file called rss.xml). -> the rss tag marks the beginning and ending of the rss feed. -> the channel tag specifies the beginning and ending of the channel. -> the link tag specifies the particular link to a url. 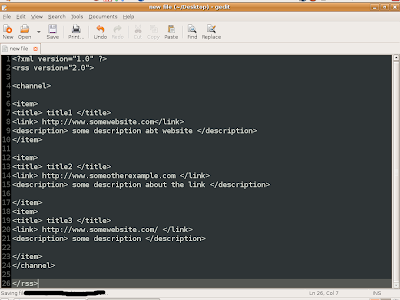 -> the description tag specifies the description of a particular link . write the above rss structure in your rss.xml file(change it as per your requirements) and place it in the context root of your website. firefox 3 browser(or firefox 2+, IE 7). one can write a java code/php code/asp code to update the rss file from data fetched from the database, the rss file then keeps on changing, so does the links displayed according to the structure in the rss file. now you are done with your own rss feed.